Along with the roast lamb Soup, baked and painted eggs, bread with cheese and raisins should not be missing from the menu. Tim Easter recipe that you propose is simple and delicious. In a bowl put flour and make a dent in the middle where we add butter, stir well and then put the eggs. Prepare the yeast from yeast, milk and a little sugar. Once you add the ingredients prepared over a flour and stir all ingredients incorporating well. We get a buns you leave to rise covered with a soft. You have to stand in a warm place. Separately, in another bowl, put together the cottage cheese, sour cream, sugar, lemon peel and orange peel, a pinch of salt, flour, vanilla and eggs. Mix well with an electric mixer until thoroughly incorporate all ingredients and at the end add the raisins. 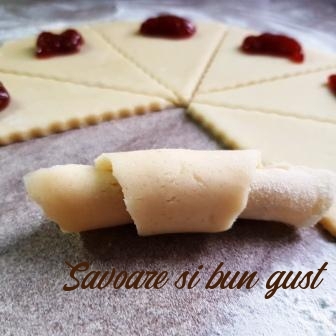 When the dough is raised well, you share in two and with the help of two sucitorului have the thickness of a finger. A sheet of dough sit in the Pan greased with butter, pour over cheese mixture, then cover with the other sheet, presandu-is not easy to stand out. We put the Pan in the oven at the right temperature and bake at the same temperature all the way to the final. Bread with cheese when baking, a leave to cool at room temperature for a few hours, powder with sugar and serve it on the traditional Holy holidays of Easter day.